This post is the eighth in a series introducing the 12 teams participating in the 2018 Wood Stove Design Challenge in November. 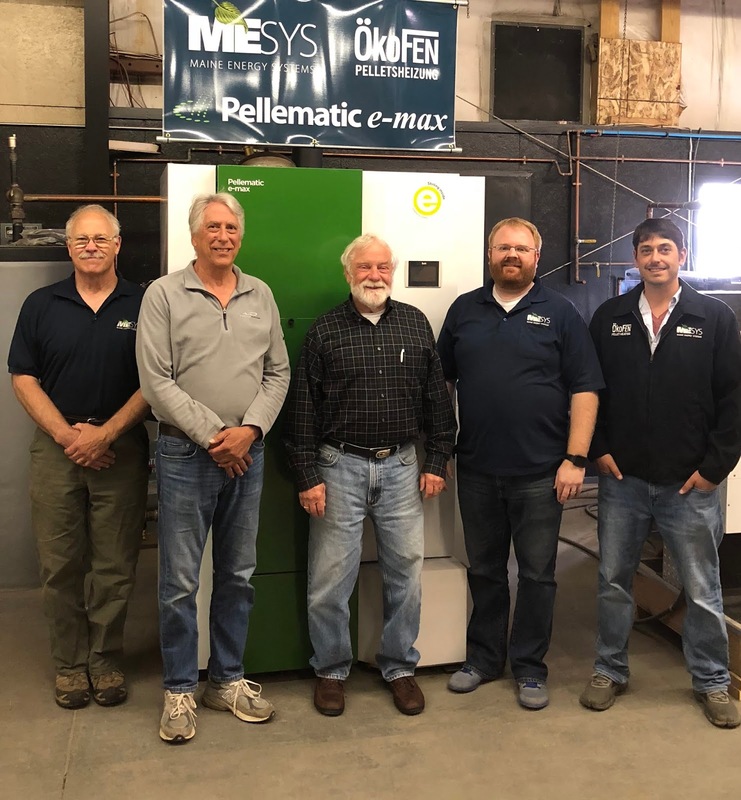 If all goes as planned, Maine Energy System’s (MESys) ÖkoFEN Pellematic e-max will power all the testing equipment, lights, computers and audio equipment for this year’s Wood Stove Design Challenge on the National Mall. Having recently hit the market in Europe, the Pellematic e-max is designed for “commercial enterprises, hotels and residential complexes,” producing up to 4,000 watts of electricity. Renewable combined heat and power (CHP) technologies that can supply 100% of heat and electricity to a home or small business come in many forms and are often part of an integrated system with solar panels. The key is matching the electrical needs with the heat needs because 95% of the energy from a pellet CHP unit will be heat and only 5% will be electricity. Thus, hotels or restaurants that need a lot of hot water year round make up many of ÖkoFen's customers for this product. A smaller version, producing heat and electricity for single family homes, was slated to come to the Wood Stove Design Challenge until organizers asked for the larger version. The residential one has a track record with scores of homes in Europe that use solar panels for electricity in the summer and additional electricity from pellets the winter. The Pellematic e-max is designed for a “medium power range”, producing 50-60 kW of thermal power and 4-5 kW of electrical power. 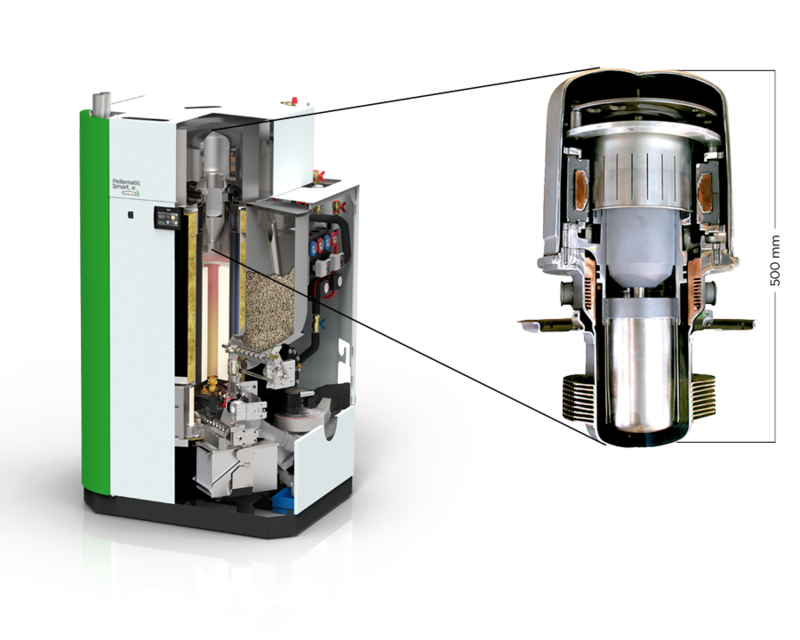 To yield these energy outputs, the Pellematic uses ÖkoFEN’s pellet heating system paired with Qnergy’s Stirling engine technology, which has allowed the model to be energy-efficient, low emitting, and a reliable source of heat and power, simultaneously. Pairing the Pellematic e-max with solar panels and a smart controller enables the system to use whichever energy source is cheapest at that moment. It plans for upcoming days based on weather forecasts. 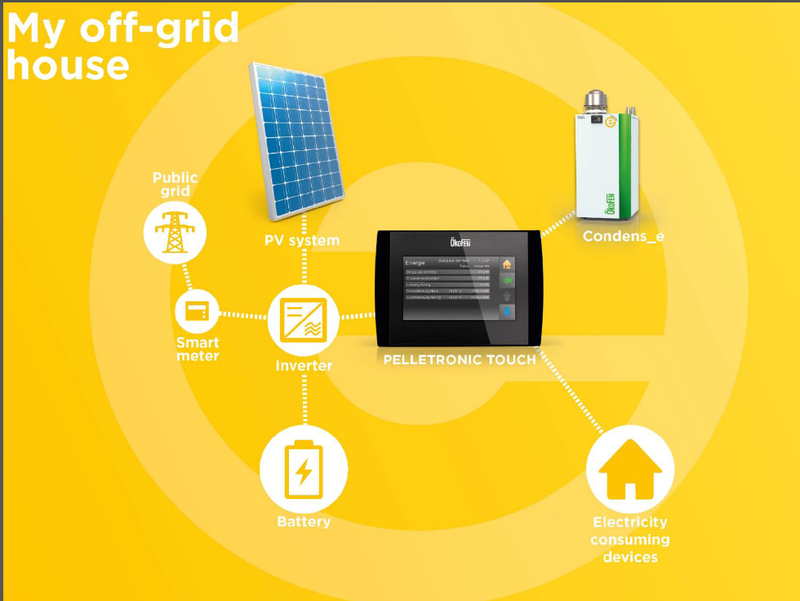 When its sunny, the system prioritizes the solar panels and can store electricity in a battery for cloudy days. If electricity from the grid is cheapest at night the controller will take electricity from the grid and also store cheap night time electricity to a battery. In the winter, when a lot of heat is needed, the controller will prioritize pellets. The homeowner or business owner does not have to do anything as the system switches between pellets, the sun, the battery or the grid. ÖkoFEN also manufacturers Pellesol solar thermal panels that combined with the pellet boiler can produce hot water for heating and all hot water needs year round. electric sources is available and cheapest. as well. When heat from the boiler is transferred to the Qnergy engine, pressure increases and works with the engine’s cooling circuit to create the temperature and pressure differential needed to move the Stirling piston and create electricity. Generating electricity from wood stoves was anything but the projected path for Dutch Dresser. His undergraduate education was in biology and Masters and Doctoral degrees are in science education. Before helping to create MESys in 2007, Dutch had an array of careers in education, computer networking and land development in Maine. Dutch says that he was moved to develop the company when his friend and partner, Les Otten, saw that the region was exporting monumental amounts of money for heating fuel and systems. Using the European heating market as an example, Les, Dutch, and Bill Strauss saw that there was a alternative way to run the heating market so that it supports the local economy without fossil fuels. Unlike the northeastern US, the European heating market kept heating dollars in the local economy by selling renewable, locally sourced units. Inspired by the European model, Dutch and Les set out to work with European heating technology to create a local market in Maine, and eventually grew throughout the Northeast. four installations of the E-max. units would be $30,000 or more, but case studies have shown a payback period of 3 - 11 years in Europe. 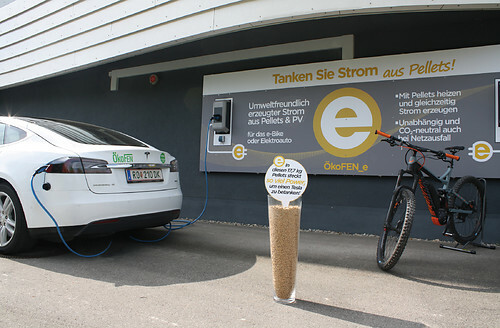 While the economics of the e-max can make sense in Europe, the demand for the unit is also driven by customers who want to go the extra mile to use renewables, based on their values and the values of their customers. Different emissions and safety testing protocols have been one of the major challenges to bringing innovative pellet central heating technologies, like the ÖkoFEN e-max, to the market. (European certification testing requirements are not accepted in the US so they have to be certified again in the US.) 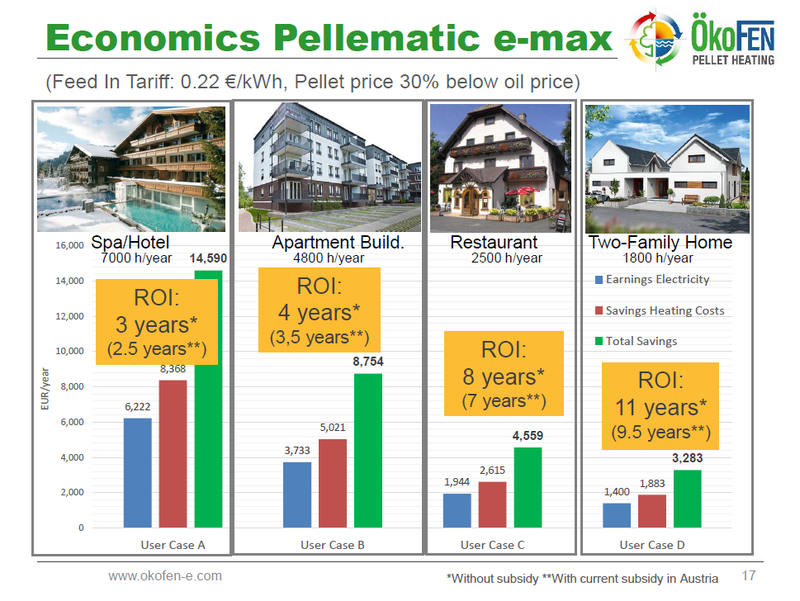 In Europe, new pellet boilers are being introduced every year and consumers can see these improved products online. But there is no way that an American company can pay to have each model EPA certified in for the US market when sales are still low. Dutch says that the time these tests can take can be “a barrier to innovation.” For Dutch, slow technological transfer in the marketplace is “a system wide issue, not just about boilers or cars, but about absolutely everything.” But it impacts appliances with low sales volumes the most. 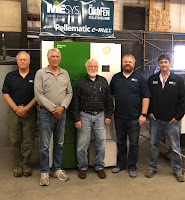 Maine Energy Systems typically sells to the northeastern US and all of Canada, so the team sees this challenge as an opportunity to expose European boiler technology to a new continent. For Dutch’s vision of global collaboration to make ever more efficient renewable technologies, this challenge means a lot. With such low fossil fuel prices in North America, very few people know about the low carbon heating technologies that are very common in Europe. 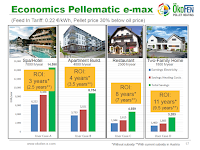 And the Pellematic e-max is a leading edge technology as it produces heat and electricity that can be paired with solar and other technologies to supply 100% of a home's energy needs.